F. W. Murnau tells the story of Faust – The demon Mephisto wagers with God that he can corrupt a mortal man’s soul. Fresh from the triumphant releases of Nosferatu and The Last Laugh, F.W. Murnau was given carte blanche to direct this epic fable of the supernatural. Freed from the burden of plausibility by the story’s fantastic premise, Murnau summoned forth a tempest of cinematic brimstone so that every scene ripples with reckless ingenuity. 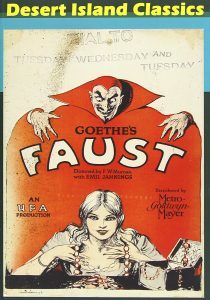 Utilizing the full resources of the UFA Studios (including elaborate miniature models and experimental special effects), Faust captures the intensity of a medieval universe stepped in religious fanaticism and pagan alchemy. F.W. 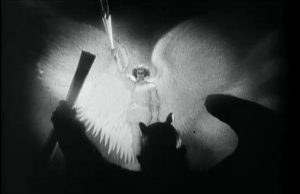 Murnau’s last German production before leaving for Hollywood is a visually dazzling take on the Faust myth. 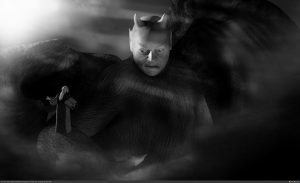 Pushing the resources of the grand old German studio UFA to the limits, Murnau creates an epic vision of good versus evil as devil Emil Jannings tempts an idealistic aging scholar with youth, power, and romance. The handsome but wan Swedish actor Gosta Ekman plays the made-over Faust as a perfectly shallow scoundrel drunk with youth, and the lovely Camilla Horn (in a part written for Lillian Gish) is the young virgin courted, then cast aside, by Faust.